Spring Branch, Making Modern More Modern! Happy 2015! I hope you all had a wonderful holiday season and are ready for a fresh start. We were able to take some time off and share it with family and friends even though we continued to work. I had hoped to keep up with the blog but something had to give. Here we are back with a project we finished a couple of weeks ago. 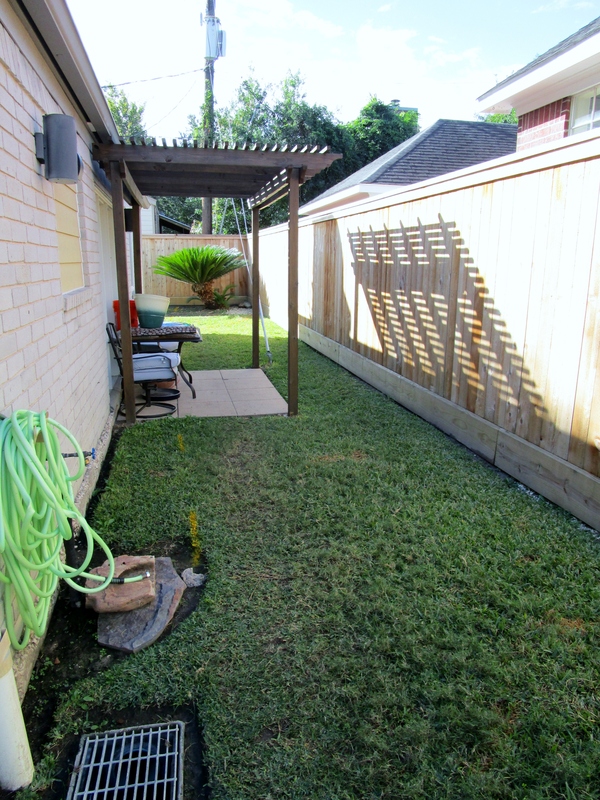 We gave this beautiful single story home, in the Spring Branch area of Houston, the garden it deserved! The off white brick on the house and courtyard wall is a wonderful feature and the clean lines are now complemented by a modern garden with lots of green plants and shrubs. 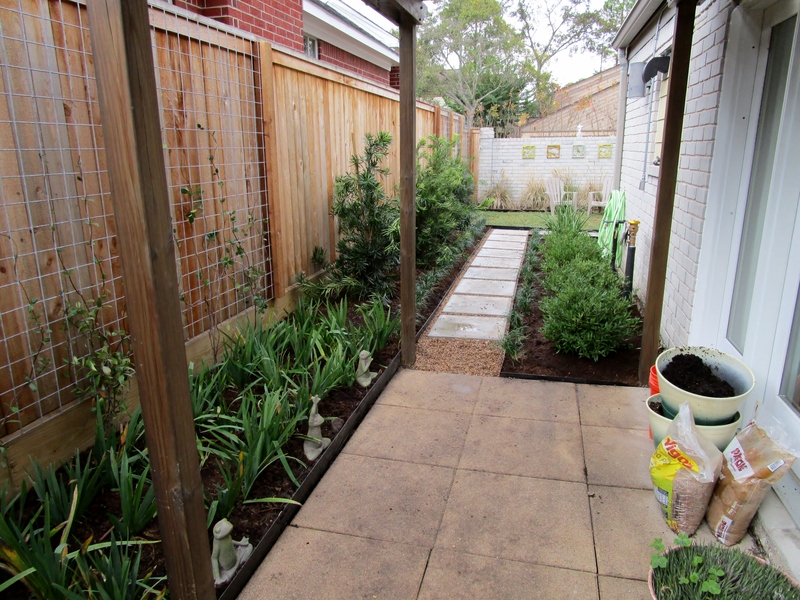 I am going to alternate between before and after to give you an idea of how we transformed each area of this garden. Going in we were given a blank slate. That is my favorite! 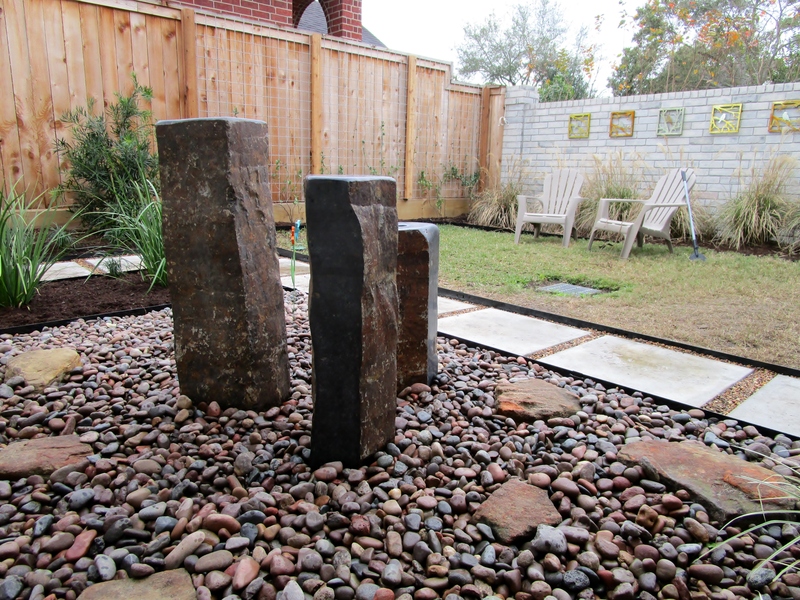 We were asked to incorporate rocks that the homeowner had been saving. She let us know she preferred simple and easy to maintain spaces. We installed an irrigation system with drip in all the beds. 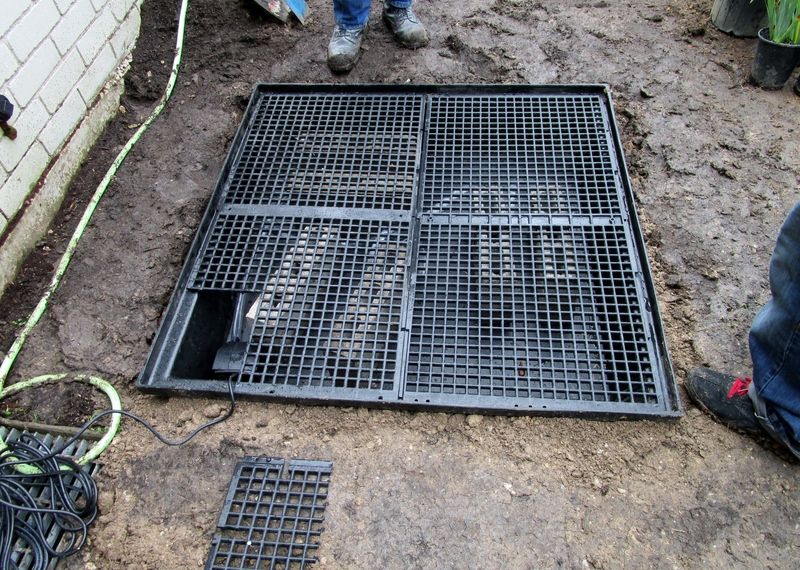 The property had an excellent drainage system so the plants will be happy! Before shot from the street. The path to the gate was a bit pinched so we added two cement pads with river rock to expand it. 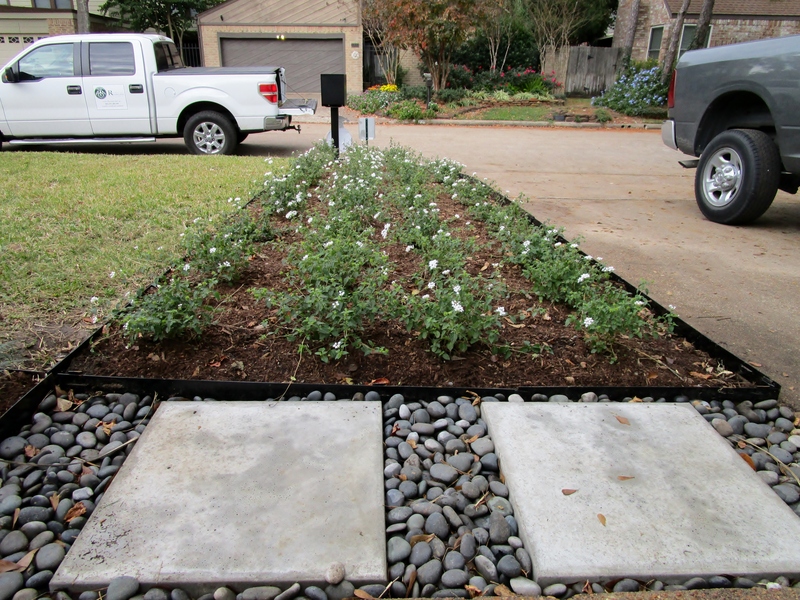 Along both sides of the driveway we added a field of White trailing lantana. On the side next to the lawn the lines lead your eye up to the entrance gate. Here in Houston we have seen this lantana bloom 9 months out of the year. It also takes shearing quite well, if you need to refresh it. Along the brick wall we planted a row of Natchez Crape myrtles, Lagerstroemia indica x fauriei ‘Natchez’. 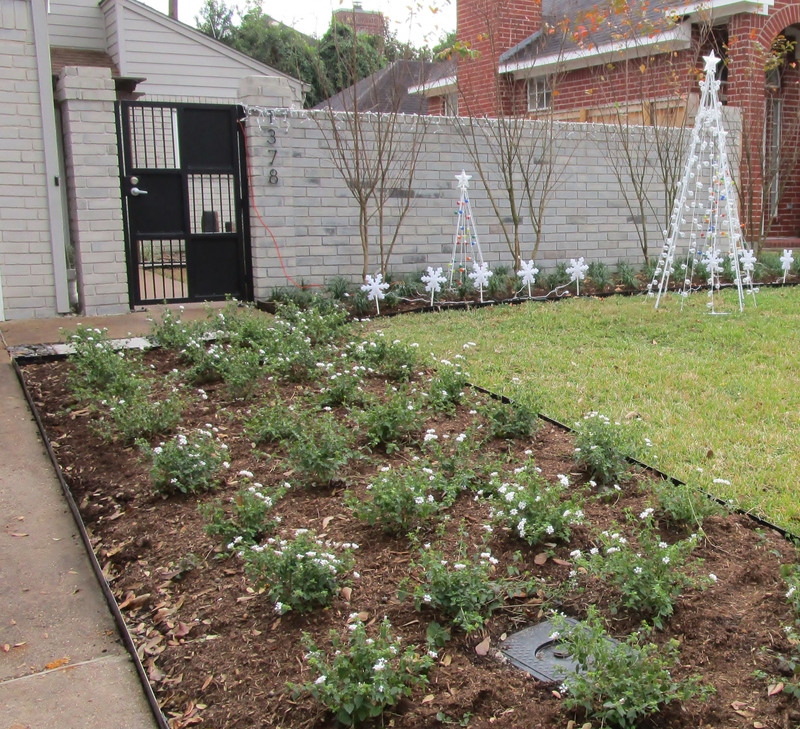 They are very hardy here in the south and add seasonal interest and work in many styles of landscaping. They burst out with white flowers the middle of summer and the leaves become reddish, orange and yellow in the fall. I think they are lovely even leafless in the winter. I put fairy lights on mine for Christmas. Around their 5th year the bark becomes a lovely cinnamon brown. We put in 30 gallon trees so we could pick them for their structure, which is well established by this size. I prefer the fan-like multi-trunk form more than the single trunk. Freshly installed and decorated for the holidays! 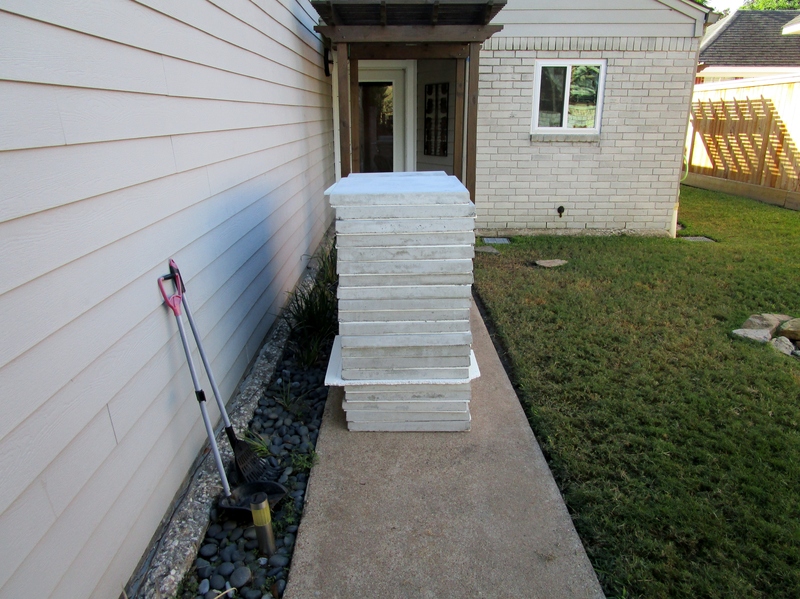 Here is the delivery of cement pads for the walk ways and back patio. The blank space under the window is the future home of a rock water feature. Before, front entrance and courtyards. 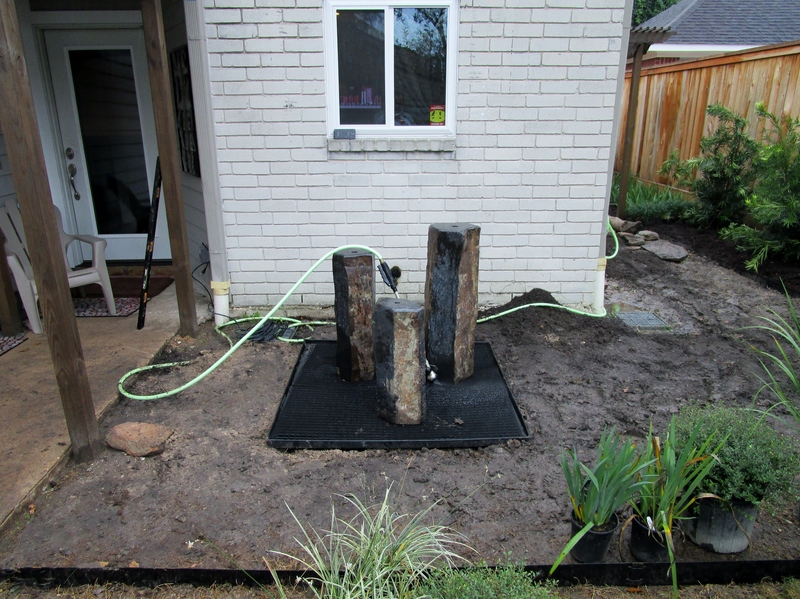 To complement all the rocks the homeowner wanted worked into the landscape we suggested a fountain of drilled rock pillars from Nelson’s Water Gardens. It is a stunning focal point as you walk into the courtyard entrance of the home. Here are a few photos of the install process. Bricks are placed in the reservoir to support the weight of the rock pillars. I like to hide the Reservoir in a way that you don’t actually know where it is and the rocks just look like they are a bubbling oasis. 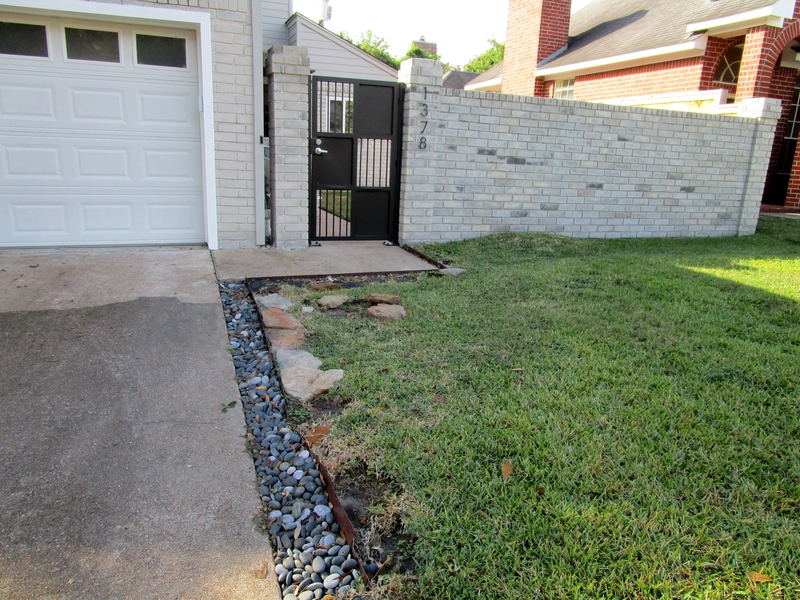 The idea is the homeowner can add more rocks as she finds them. It would even be fun to add drift wood or other found objects. I think it is important not to over design a space and leave room for personal touches made by the people who live in the garden. Rocks in place and reservoir disappeared. View from front door looking out to courtyard. You can see that we used a simple palate of materials and colors. I love the art pieces the homeowner added to the brick wall. They are perfect the way they complement the ornamental grass and visa versa. Because the wall is so static and solid I decided to go in the opposite direction with the plantings. I used a dwarf version of maiden grass, Miscanthus sinensis ‘Adagio’. 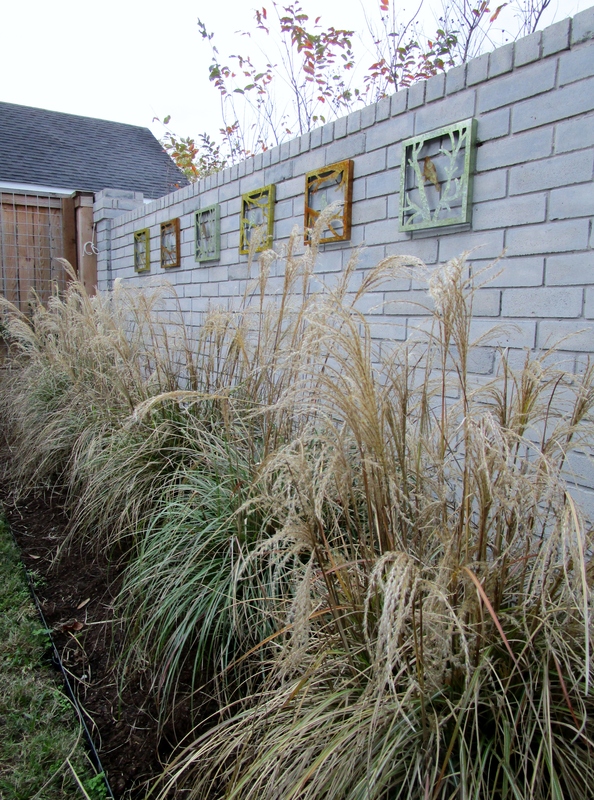 This ornamental grass (and several others) were introduced by Kurt Bluemel. He named Adagio for his wife an accomplished musician. The simple clean row will change through out the seasons. In my opinion it will be at its best in autumn, when other plants are fading. It grows between 3 and 4 feet high and wide. It does well in almost any soil, from loose sand to heavy clay, and does not require good drainage or fertilizer. It prefers full sun except in warmer regions where some afternoon shade is best. In the fall when it flowers the plumes have a pink tint that fades to buff as the seeds are cast out to the wind. You can even cut the stalks and use them in dry flower arrangements. For more instant impact we started with larger plants. As you round the corner from the front courtyard you come upon a small patio and long expanse of fence. The desire was to make more use of this space. We added plantings that can be viewed from inside through the sliding door, while also making it a more pleasurable place to sit. There was the hope that we could do something to obscure the view of the neighboring buildings too. 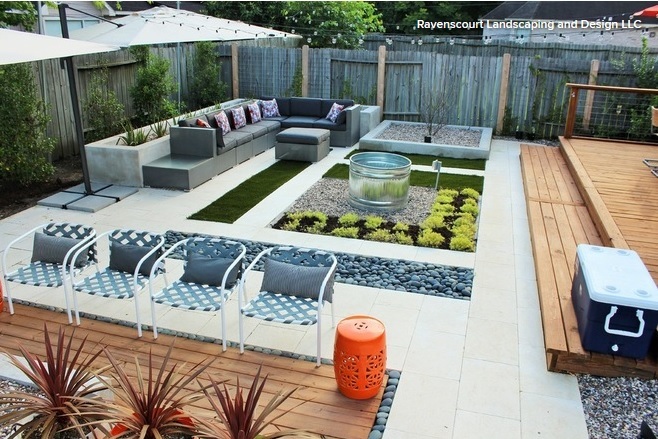 The lawn in this area was just taking up space but doing nothing to add to the visual interest. 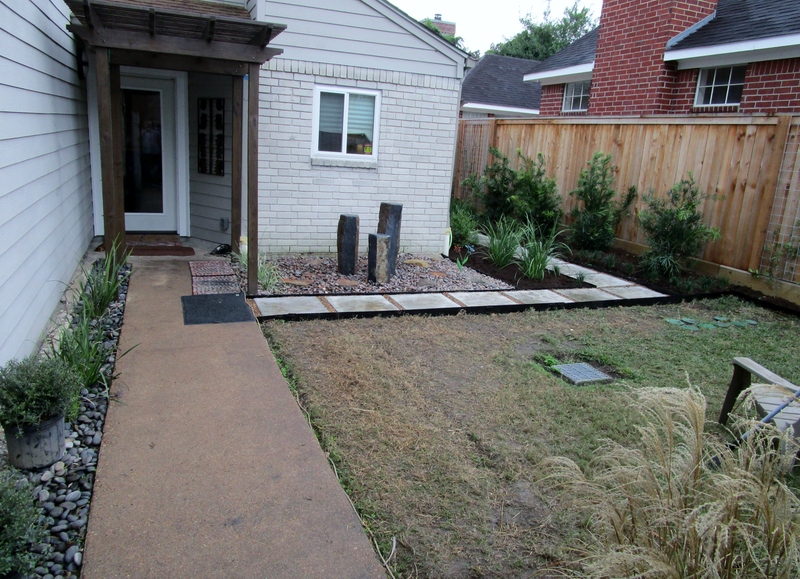 We put in a cement pad path connecting the front entrance to the side entrance that also designed to created beds on each side where we could plant evergreen shrubs. 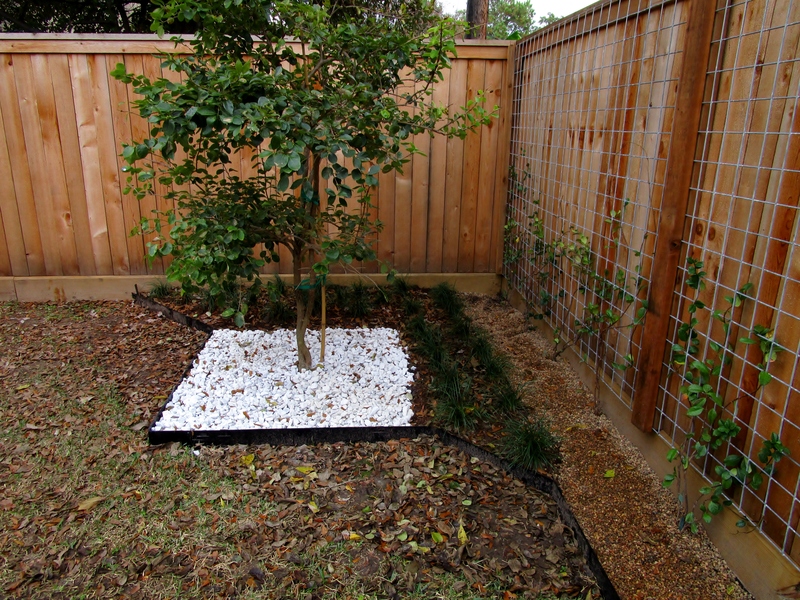 On the fence side we added Podocarpus with a break for a trellis of Star jasmine on welded wire right off the patio. In front of the jasmine trellis is a field of Louisiana iris. Against the house is a row of Frostproof gardenias, Gardenia jasminoides ‘Frostproof’. This variety of gardenia does well in Houston. They work well in smaller bed with their slower growing tighter form than you have from the traditional gardenias. The beds are bordered with Big Blue liriope, Liriope muscari ‘Big Blue’ also know as Lily Turf. When it fills in it is meant to create a continuous soft border that will cascade over the edge of the gravel and hide the steel edging. Before shot of back yard. Now on to the back garden. The fence was getting a bit worn and was replaced before we started. 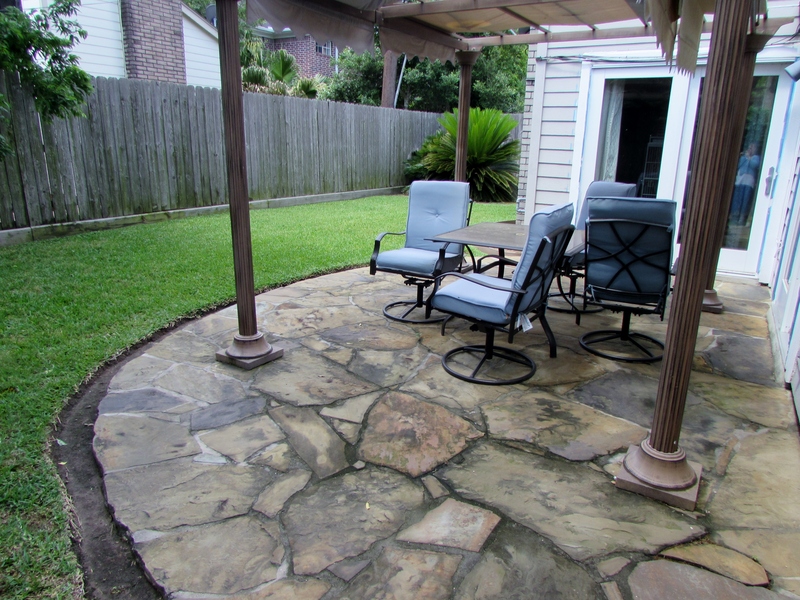 The existing patio didn’t really lend itself to a clean modern look. 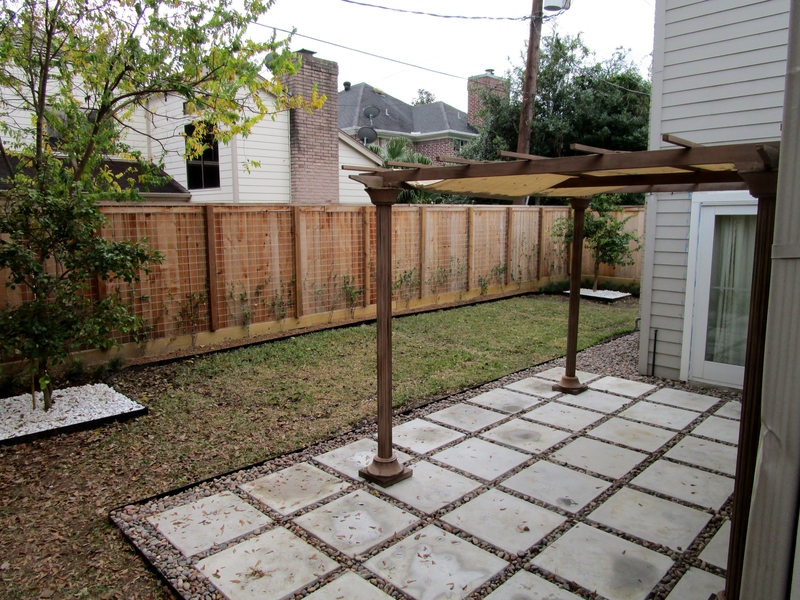 We designed a pergola but also left the option to reuse the existing metal pergola. 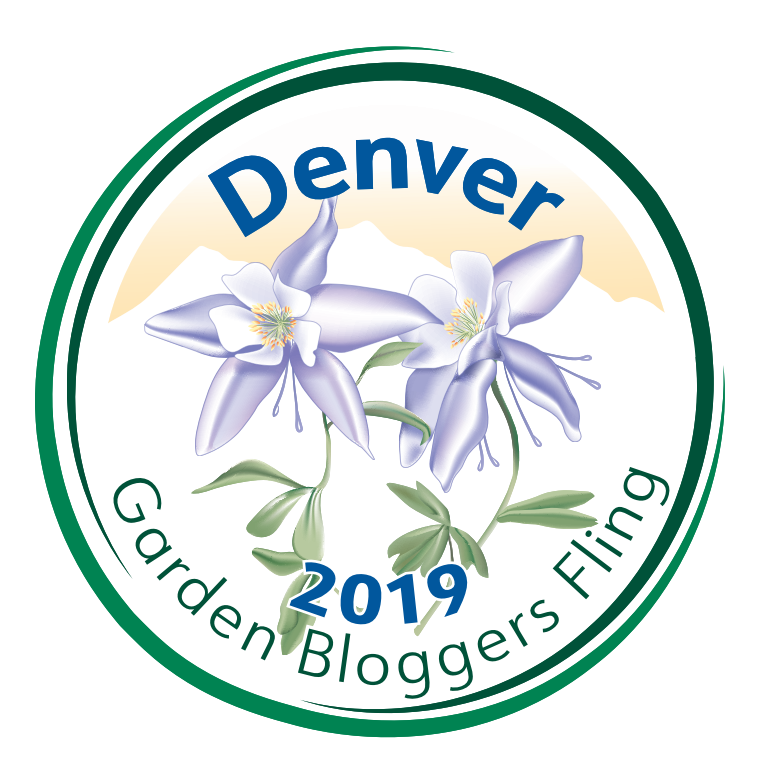 We planned for a Chinese Fringe tree in the corner near the patio. They are not too common in this area but you can’t miss them when they bloom. The homeowner decided that the Sego in the other corner had to go and asked for a matching Chinese Fringe tree. While I hate to replace plants unnecessarily, this made me happy because it really worked better in the design. We continued on with the simple clean lines and the only plants are the two flanking Fringe trees with beds of Mondo (monkey) grass behind and welded wire trellis attached to the fence and planted with Star Jasmine. To help keep the lines straight, when the mow and blow guys come, we installed 10 gauge steel edging. I prefer the black because it disappears visually more than the ones that are green or brown. Up close of corner bed with rocks provided by the homeowner. The shape of the bed mirrors the cement pads in the patio. This is a garden we would like to keep up with and visit as it matures. We hope you enjoyed the photo tour. Feel free to ask us if you have any additional question about this project! 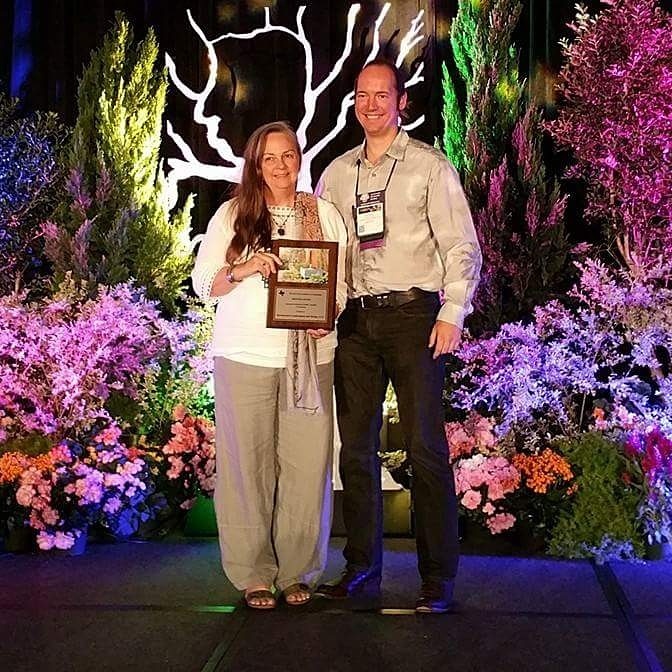 Happy Gardening from Shawn and Laurin! Very nice changes! Adagio miscanthus is a favorite of mine too. It gets beautiful hot pink and orange streaks on its leaves in the fall if planted in full sun. Thank you Pam : ) I just started using it and am very pleased. I can see a green and white theme going on here that will make this a soothing beautiful place. I really like what you did here. Thank you Debra. Yes green and white. The homeowner was not actually interested in flowers at first but when I suggested only white she was delighted! What a beautiful transformation! I love love love the water feature. Mind if I steal that idea? Thank you Laura! The reason we share our project is to give people good ideas…so yes steal away!!! I love the MCM aesthetic and design but in my heart I love an exuberant perennial garden. I especially like the stone obelisks or … I forget the word..stiles?. The big cut rocks. Thanks for sharing. Thank you Dunelight! I to love flowers but this garden was meant to be shades of green, I added plants with white blooms to give a crisp contrast but not be to fussy. The client was delighted.